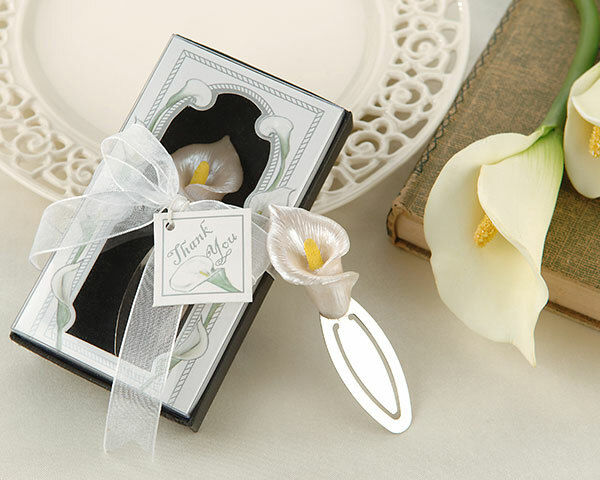 Remember Romance Calla Lily Bookmark in Gift Box - EconoBride - Budget friendly wedding favors. The enchanting calla lily is a traditional wedding symbol known for its longevity and for its finesse. Guests will remember the romance of your special day each time they see the beautiful calla lily peeking from above the pages of their favorite book. Each calla lily favor is packaged in a dainty gift box resembling a calla lily garden trellis with the pearlescent calla lily and stainless steel marker upon a contrasting black base. A sheer white organza ribbon is then wrapped around the box with a thank you card attached. Measures 3 1/2" x 3/4".